LONDON—Oscar the cat may have lost one of his nine lives, but his new prosthetic paws have made up for it. After losing his two rear paws in a nasty encounter with a combine harvester last October, the black cat with green eyes was outfitted with metallic pegs that link the ankles to new prosthetic feet and mimic the way deer antlers grow through skin. Oscar is now back on his feet and hopping over hurdles like tissue paper rolls. After Oscar's farming accident, which happened when the 2 1/2-year-old-cat was lazing in the sun in the British Channel Isles, his owners, Kate and Mike Nolan, took him to their local veterinarian. In turn, the vet referred Oscar to Dr. Noel Fitzpatrick, a neuro-orthopedic surgeon in Eashing, 35 miles southwest of London. Together with biomedical engineering experts, Fitzpatrick gave Oscar two metal prosthetic implants, or pegs. Those were attached to custom-built faux paws that are a bit wobbly, to imitate a cat's natural walk. But first, he covered the brown implants with black tape to match Oscar's fur. Fitzpatrick said he and biomedical engineers designed the artificial paws so that they would be fused to the bone and skin. "That allows this implant to work as a seesaw on the bottom of the animal's limbs to give him (an) effectively normal gait," he said. "Oscar can now run and jump about as cats should do." The veterinarians then inserted the peg-like implants by drilling them into Oscar's ankle bones in his rear legs. The metal implants are attached to the bone where Oscar lost his paws and were coated with a substance that helps bone cells grow directly over them. The cat's own skin then grew over the end of the peg to form a natural seal to prevent infections. After rehabilitation training that taught Oscar how to walk again, the cat was on all four feet in less than four months. Oscar's owners said they hoped his new paws would also further the technology for developing artificial limbs for humans. "This is a pretty lucky cat," said Dr. Mark Johnston, a veterinarian and spokesman for the British Small Animal Veterinary Association. "Giving a cat artificial limbs is a very novel solution." Johnston said that while there are many "perfectly happy" three-legged cats and dogs, animals that lose two legs do not usually fare as well. Dogs might cope better with some sort of animal-wheelchair for their back legs, but cats don't usually adapt to that because of their freer lifestyle, he said. "If a cat has two legs that are damaged beyond repair, it's very hard to keep him going," he said. "We would generally euthanize a cat in that situation." He doubted the technique would be widely available due to the cost and said it was still relatively rare for animals to lose two legs at once. Gordon Blunn, head of biomedical engineering at University College London, who led the effort to make Oscar's fake paws, said they cost about 2,000 pounds ($2,996) to make, not including the cost for the operation itself. In 2008, Fitzpatrick made an artificial knee for a cat named Missy who was struck by a hit and run driver. In the U.S., several animals have received artificial limbs directly attached to their bones at North Carolina State University's College of Veterinary Medicine.Dr. Johnston said the next six months to a year would be critical for Oscar. He said veterinarians would have to closely monitor the feline to make sure no infections, sores or other movement problems crop up. "It may not last forever, but even if you provide the cat with a few years of pain-free mobility, it may well be worth it," he said. This story was first reported in 2010 and since then Oscar has become somewhat of a world hero. 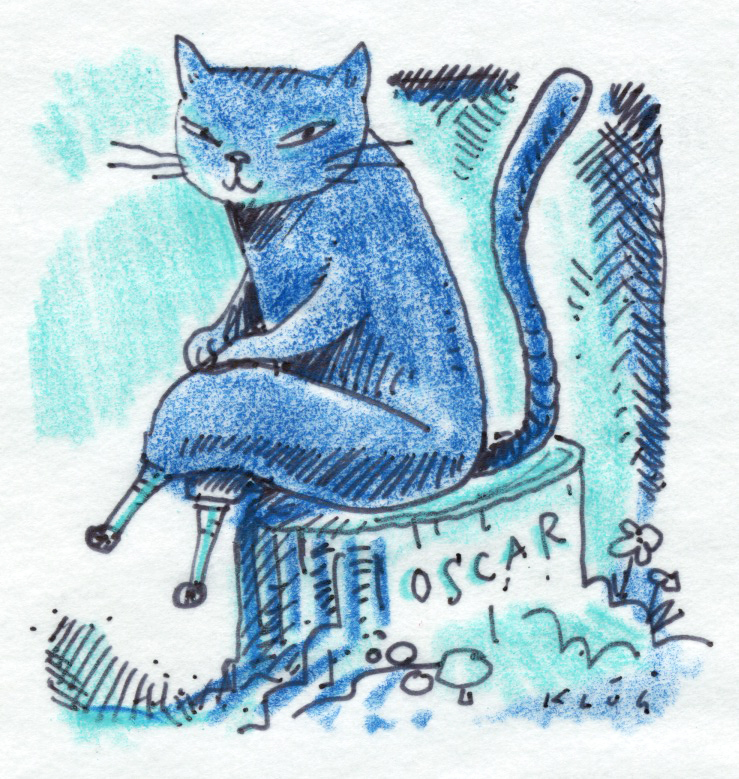 Oscar holds two Guinness World Records, one for being the first animal with two bionic leg implants, and the other for being the first animal to receive implants into its moving joints.